We visited a lot of Buddhist temples on our vacation. By "a lot" I mean maybe fifty or sixty. By "a lot" I mean a few too many. I write to you from a hotel patio on an island off the coast of Thailand. Palms are rustling, tropical birds chirping, some French kids splashing around in the pool. I can hear, but not see, the ocean. It's pretty nice, but not quite paradise because it's also roasting hot and we're totally lethargic and covered with mosquito bites. My bathing suit is too tight and we keep nervously joking about tsunamis. Did you see The Impossible? Don't! It will subtly darken any future visits to the beaches of southeast Asia. I won't bore you with a long blow-by-blow account of this beautiful trip Isabel and I took to Myanmar and Thailand. Just a short blow-by-blow. I'd decided this trip was a huge mistake about a week before we left. I worried Isabel wouldn't enjoy it, that she'd sigh and complain about the heat and exotic food, I'd lose my temper, we'd bicker and have a miserable or even just mediocre vacation together and then she'd go off to college and I'd never see her again. Something like that. We arrived in Yangon after twenty hours of sleepless air travel and our guide took us straight from the airport to see a Burmese white elephant. Standing there in the soupy heat looking at this white elephant (actually, pinkish beige) I began fretting about Isabel's state of mind. They call this a WHITE elephant? Was she weary? Was she hot? Was she sighing? Should I ask the guide to take us to the hotel so she could rest? I glanced at Isabel to read her mood and in that instant my worries all evaporated. She smiled at me, totally radiant. She was into it. Not minding the jet lag, not minding the heat, just dazzled and fascinated by the strangeness and beauty of this new place like any sane, curious person would be. Why had I doubted her? I knew then that this trip was going to be wonderful and haven't worried about anything except dysentery and tsunamis since. 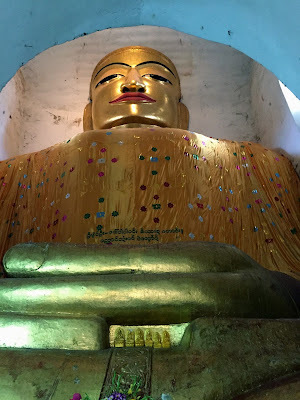 There's more I could say about Yangon -- about the lovely British colonial architecture, the magnificent Shwedagon Pagoda, the Reclining Buddha, how quickly you become accustomed to women with thanaka paste on their cheeks and men in longyis -- but I promised to keep this short. There are more than 2,000 pagodas in the ancient kingdom of Bagan and we visited a good number of them. (My picture does an ok job capturing Bagan's splendor, but this one does it better.) We climbed pagodas, circled pagodas, admired carvings outside pagodas and murals in the cool, dark interiors of pagodas, where you could hear and occasionally see the resident bats. Has David Quammen's Spillover been translated into Burmese? It should be. Overheated dogs slept on the terraces of the pagodas. The dogs in Myanmar appeared to be dead all day and then came to life when the sun went down. Bagan is astonishing. If you have a bucket list, Bagan belongs on it. In my favorite Bagan temple, an enormous buddha was packed as tightly as a chick inside an eggshell. Super-weird! It was in Bagan that Isabel and I made our first foray into a Burmese restaurant. The place had been recommended by both a tour guide and hotel receptionist, so we assumed the menu would include dumbed-down Burmese dishes translated into English. Wrong we were. Myanmar isn't all that touristy yet, and I'm ashamed to report that authentic Burmese food terrified us. Not only were there no English translations on the menu at this restaurant, there was no menu. We sat down and scowling waitresses began smacking dishes on the table in front of us. Dish after dish after dish of murky, room temperature mystery food. Seventeen dishes in all, including dessert. We finally identified some chicken and pork in oily sauces and a pile of leathery fried fish. There were also pastes and pickles that resembled those we'd just seen an hour ago, mounded in baskets and dotted with flies at the local market. The hot food definitely wasn't hot, nor was the cold food cold. At nearby tables, big, chatty groups of Burmese were happily gobbling up their lunches, but all I could think was: DYSENTERY. We picked at our meal, some of which was tasty enough, like the stir-fried greens, but most of which was repulsive, like the gristly gobs of tepid pork. After we'd made a polite dent in maybe a third of our dishes, we paid up, skulked off into the blazing afternoon, and didn't venture into another Burmese restaurant on our own for the duration of the trip. Inle Lake is a vast lake in the middle of Myanmar where villagers live in stilted teak houses built on the water and travel around on long, skinny boats. We saw lots of babies during our time on Inle Lake, but no barriers or baby gates between the living spaces and the water. I'm a product of my (anxious, death-fearing? sensible, life-loving?) culture and couldn't stop thinking about the dangers. Eventually I asked our excellent tour guide if babies ever fall out of the houses and drown. She answered promptly and cheerfully, "Sometimes they do, yes." There are really easy measures one could take to prevent babies from drowning, and I would certainly take them if I lived on Inle Lake. But then where exactly do you stop? I thought about this a lot in Myanmar, where they have come to very different conclusions than we have. Because it was monsoon season, we were among the only tourists on the lake and while we were drenched by the rains, it was absolutely great. In a temple on Inle Lake you'll find a museum that contains valuables -- cash, watches, jewelry -- that devout visitors decided they cared too much about and gave up. These buddhas in the same temple were originally shaped like humans, but have been so thickly layered with gold leaf that they have become blobs. A few of Myanmar's 3 million monks waiting in line for lunch in Mandalay. If there's one thing I hate, it's tourists who visit a country for a few days and come away with simplistic generalizations about a whole people. Without further ado, here are my simplistic generalizations about the people of Myanmar: There's a gentleness and languor to the Burmese that was startling and disarming and made both Isabel and me feel jaded, worldly, and slightly sad about the state of our anxious modern souls. I don't want to romanticize underdevelopment and isolation, but you can't spend a week in Myanmar without noticing that the people are strikingly tranquil when compared with people you meet almost anywhere else in 2015. The Burmese drive slowly and calmly and walk slowly and calmly. They don't worry about seat belts, life vests, or, as I've mentioned, baby gates. You will see more people laughing and talking on the street in 10 minutes than you will in Mill Valley, California in a month. I don't think we once heard a child cry or whine during our time in Myanmar, and there were children everywhere. Although everyone we got to know even slightly complained about the repressive military regime, they did so sort of cheerfully. 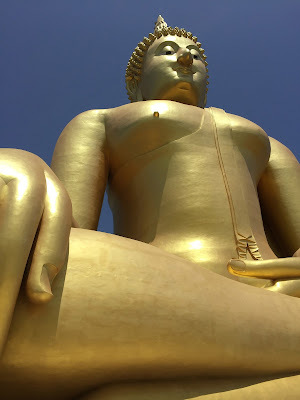 It would be easy to chalk this up to Buddhism, but Thailand is also Buddhist and we sensed no such tranquility among the Thais. Make of my facile generalizations what you will. I really want (need?) the long version .. please? I just didn't have it in me. . . trying to travel and write at length (but well) was too much. So it would be nice to hear about Burmese food where you were not "on your own." Surely the entire gastronomic experience was not gnarly? I have the Naomi Duguid cookbook, but haven't done much with it yet (I think I am discouraged by the need to buy yet MORE exotic elements that might languish in my already burdened fridge/on my already crammed shelves etc. etc.) But perhaps if you had some lovely meals, I might be galvanized. I love Burmese food, cooked extensively from Burma, and often eat Burmese here in the U.S. But we really had no great meals in Myanmar. None. We mostly ate in hotels where the food was very generic, at best. Maybe we just had bad luck. There weren't restaurants and attractive street vendor options everywhere like there are in Thailand -- or at least we didn't see them. It was just sort of a bust, gastronomically speaking. In all other ways, absolutely lovely. You had me at pagodas and Buddha. You lost me at roasting hot temps and oily meats questionably prepared. lol I look forward to reading more. It was great! Even with the heat and oily meat. That's too bad about the Burmese food. I did make a dinner from Duguid's cookbook and, while we generally liked it, leftovers languished in the fridge until they were eventually thrown away. Not sure if that small experiment was a reflection on Burmese food or Duguid's recipes. Thanks! I made a few really great things from Duguid's book, but there were some flops as well. I haven't been able to get past the picture of the elephant, honestly. It looks so miserable. The chains on its leg look so tight. That is so, so very awful to do to such an intelligent creature (or to any creature really). I've completely lost my appetite (literally and figuratively). An absolutely SPLENDID account of your travels thus far! I too would be up for a long version -- don't hold back! I second the request for a long version! I went to Burma last year, and had a very different experience of the cuisine. We ate exclusively at Burmese places, with a side-trip to a Shan State cuisine place in Inle Lake, and while the food was always served at room temperature, we never got sick (and I also feared the worst at our first dining venture). I think you may have missed a treat! I think you might be right that we missed a treat! I think we had bad luck and were lacking guidance. We did far better in Thailand, but it's so easy to eat well in Thailand. Lucky you! Loved every word. Your sense of humor closely mirrors mine so I laughed at the appropriate times. Hopefully. Can't wait for the next installlment! I was very upset and horrified at what they are doing to that elephant. I will not go to Asian countries because of how they treat animals. And their uneducated ideas on using animal parts for health reasons. I am horrified. I thought Thailand was not like this but obviously they do not respect animals. Ugh. Did you know you can create short urls with Shortest and get dollars for every click on your shortened links.